Late Republican Party booster and controversial Fox News mogul Roger Ailes, once described as the "most powerful man in media," was the producer of the popular long running talk show The Mike Douglas Show. When presidential candidate Richard Nixon appeared on the show, Ailes told him he needed a media advisor. Nixon hired him, and Ailes helped Nixon go on to become the President of the United States. Ailes also went on to help Ronald Reagan get re-elected and helped guide George H. W. Bush to victory. 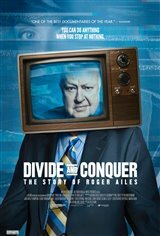 Filmmaker Alexis Bloom takes a look at Ailes' life, including his childhood, and reveals that he created a myth about his life, including his childhood. He knew how to produce hits and under his guidance, Fox News became the number one cable network. He was also a master manipulator who didn't trust anyone and due to his hemophilia, he lived in fear of dying. After years of sexual abuse allegations from numerous women, who claimed he'd threatened to have them fired unless they slept with him, in 2016 Ailes stepped down from his post at Fox News, his career going down in flames.